Comm Eye Health Vol. 17 No. 52 2004 pp 62. Published online 01 December 2004. Haydom Lutheran Hospital, P.O. Mbulu, Tanzania. Recently I noticed with surprise, during extracapsular cataract surgery, that cortex was retreating from the anterior port of my simcoe cannula during aspiration, instead of being drawn towards it. On closely examining the cannula, I discovered that the infusion entering the luer connection was plumbed to exit at the anterior port, while the syringe was vigorously aspirating anything near the large side port; iris, anterior capsule, even posterior capsule; certainly not what I was expecting! I discussed this by email with the supplier, who apologised: “I packed Reverse Simcoe in error!” and offered a replacement. I find that the ‘Reverse’ Simcoe is a frequent visitor to extracapsular cataract sets. The surgeon, keen to get in among the cortex, often does not notice he is using one until the outcome of his operation has been affected because the wrong structure has been sucked into the cannula. Preoperatively, examine each simcoe cannula before use. 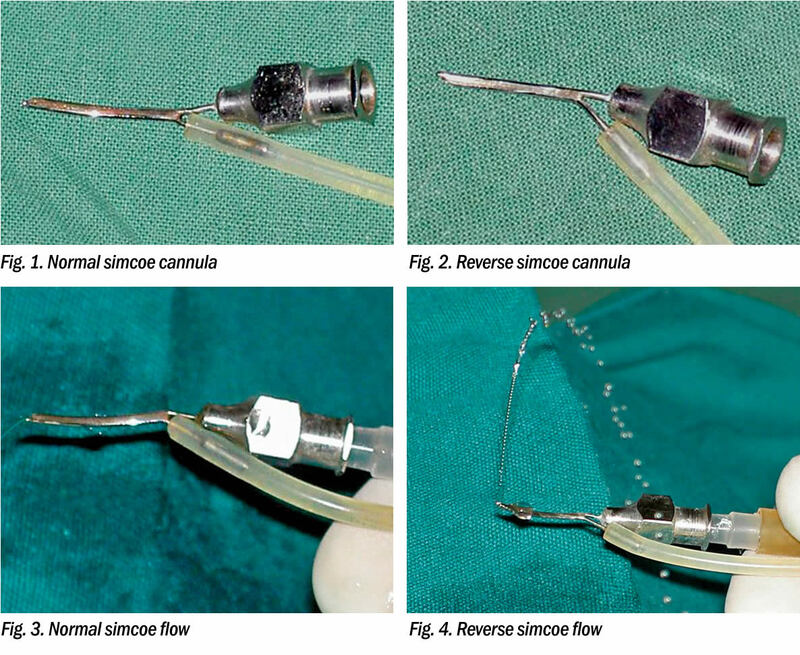 Check that the luer port which receives the solution giving set, allows outflow via the larger side-port, and the smaller anterior port is connected to the narrow pipe which accepts the pvc tubing and aspiration syringe (Figure 1) and not the other way round (Figure 2). At operation, before entering the eye, run the drip, and observe the outflow of the irrigating solution: If it arcs down and forwards, this is likely to be a normal simcoe (Figure 3). If however the outflow goes straight up before curving down (Figure 4), then you are about to use a reverse simcoe! When operating, observe which port appears to be sucking in the cortex. This should be the smaller anterior port, while the anterior chamber is maintained by the flow from the larger side port. Inadvertent aspiration through the larger side port of a reverse simcoe, while irrigating through the smaller anterior port, can cause unexpected shallowing of the anterior chamber.